The war clouds are gathering. Brutus is encamped in Smyrna, Asia (current Turkey), waiting for Cassius and his legions to arrive. From there they will march west toward Italy to engage in a civil war for the control of Rome. They have seventeen legions and seventeen thousand cavalry, a little over 100,000 men. Antony and Octavian together have nineteen legions and thirty-three thousand cavalry, approximately 128,000 men. Both sides have sizeable fleets. Antony has sailed his army from Brundisium on the lower east coast of Italy across the Adriatic Sea to the port city of Dyrrachium on the west coast of Macedonia. He plans to march east to challenge Brutus and Cassius. He is urging Octavian to make the crossing immediately because enemy ships are starting to sail from Greece toward Brundisium. But, Octavian has a problem in It aly. Sextus Pompey, the son of Pompey the Great has taken control of Sicily, and with his fleet is starting to block the grain ships from the East from sailing north to Rome. If he continues to do this he will cause a famine in Italy. 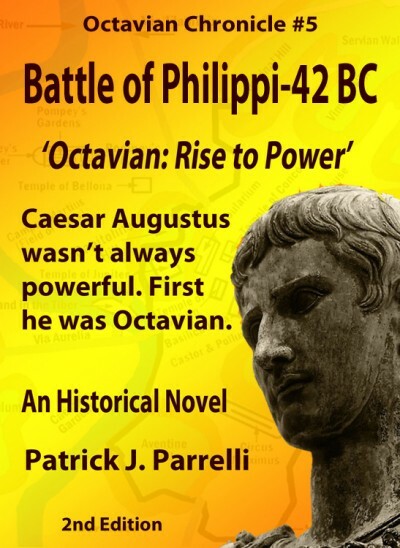 Octavian decides to have one of his commanders attempt to defeat Sextus in a sea battle in the Strait of Messana before he leaves to join Antony. Brutus has received word that Antony has landed his army on the west coast of Macedonia and is planning to march east along the Via Egnatia. 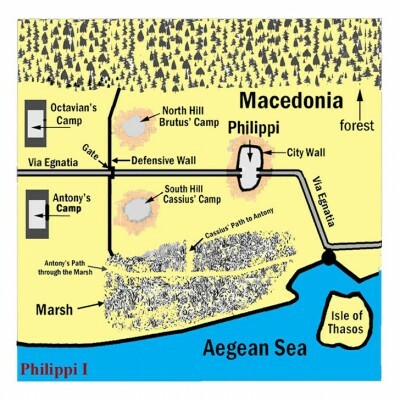 He and Cassius will march their armies north to Thrace, then turn west onto the Via Egnatia to find a location that will give them a strategic advantage over Antony and Octavian. Although they have fewer men, Brutus knows that they have land lines of supply all the way back to the East and that Octavian and Antony will have to rely on supply ships crossing the Adriatic Sea from Italy. He is hopeful that a combination of bad weather and attacks by his fleets will slow down if not totally defeat their fleets. Brutus has one problem though that he tries not to think about, that he and Cassius will be facing the dangerous, tough, and daring Mark Antony, a veteran of many fierce battles and wars which he fought under the command of Julius Caesar.